The stylish Sport Car Top Carriers boast smart features such as aerodynamic design, the ZipRight urethane coated zipper system, and 3/4 of the way around easy access opening. They come in three unique sizes that fold up into stuff sacks for storage. The Rightline Gear PackRight Sport 1 Car Top Carrier is aerodynamically designed to help save $$$ at the gas pump. The carrier is 100% waterproof, unzips 3/4 of the way around for easy loading, and attaches to vehicles WITH or WITHOUT a roof rack. 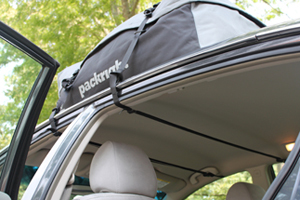 Connect the carrier's straps to a roof rack, run them through the vehicle, or purchase the PackRight Car Clips to attach them to the vehicle's door frame. The Sport Car Top Carriers feature the innovative ZipRight zipper system, a urethane coated zipper located on the protective flap to keep rain out. Other roof top carriers feature a conventional zipper located at the junction of the protective flap and the bag-right where the wind forcefully drives a large amount of rain water. ZipRight’s “in the flap technology” solves the age old problem of water coming into the cargo carrier through the zipper. If you would like to be 110% sure of keeping your gear dry, you can add the PackRight waterproof liner. You will find a Sport Car Top Carrier to fit any size vehicle, from the smallest compact car to the largest SUV or minivan. The roof top carriers open ¾ of the way around the top for easy loading. All of the Sport Car Top Carriers can be used on vehicles with or without a luggage rack-please see the Sport Set Up Guide for details. Attaches With or Without a roof rack. It is important to clean the roof of your vehicle first. You may use the PackRight Non-Skid Roof Protection Pad (Fig 1) under the car top carrier to further protect your roof and to keep the carrier from moving. It is easiest to load your Sport Car Top Carrier on the top of your vehicle with its closed end facing forward. Make sure the roof rack is secure to your vehicle and don't load over its weight limit. The Sport Car Top Carriers un-zip ¾ of the way around their top (Fig 2) for easy loading. Place items with sharp or pointed edges in the middle, packing softer items around them. Remember that the roof luggage carriers are aerodynamic, so they will be shorter in the front and taller in the rear-load your gear accordingly. Pack the cargo bag full so that the sides are pulled tight, preventing excess material from flapping in the wind which can damage the bag and cause the load to shift, loosening the straps. Engage the ZipRight Zipper system and fold the protective flap down (Fig 3). Make sure to secure all of the Velcro closures. The PackRight Security Cable Lock (Fig 4) can be used to secure the cargo bag on your vehicle. Run the cable through the two zipper pulls and around the roof rack before re-connecting it to the lock. Remove extra slack in the cable so the lock doesn't bounce around. A properly packed Sport Car Top Carrier should look like the picture below when you are finished. The Sport 3 and Sport 1 Car Top Carriers come with (4) straps (Fig 5). When using these two roof luggage carriers, attaching two straps front to back between the cross bars or two straps side to side between the side rails will sufficiently secure the carrier. Using all four straps, however, provides the most secure method of attachment. The Sport Jr. Car Top Carriers come with a Car Clip Strap Set (Fig 6). When using the Sport Jr. Car Top Carrier on a vehicle with a roof rack, remove the clips from the ends of the two straps. You may use the straps front to back between the cross bars or side to side between the side rails. Each strap has two strap pieces connected through a center buckle. Unthread the short strap piece from the buckle and secure it to your rack by threading its end through its loop and pulling tight (Fig 7). Go to the opposite side of the vehicle and secure the long strap piece to the rack by the same method. Run both straps through the d-rings on each side of the cargo bag (Fig 8) and bring them together on top of the bag. Thread the short strap piece back through the center buckle (Fig 9). Make sure that you have enough length on each side of the buckle so that the straps will not pull out under tension. Run the StrapRight Straps (Fig 10) provided with the Sport 3 and Sport 1 Car Top Carriers through the open doors of the vehicle and around the carrier to secure the load. The clips may be removed from the Sport Jr.’s Car Clip Strap Set to use the straps in the same way. Each strap has two strap pieces connected through a center buckle. 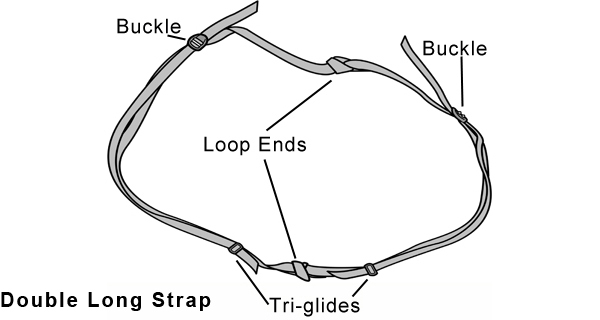 Unthread the short strap piece from the buckle and connect its loop end to the loop end of the long strap piece (Fig 11). Run the strap through the open vehicle and through the d-rings on the sides of the cargo bag, bringing the two ends together over the top of the carrier. Then rethread the short strap piece back through the center buckle (Fig 12) and tighten appropriately. With larger vehicles, one strap may not be long enough. If that is the case, you can connect two straps together using a similar procedure as described above: Leave one strap as originally provided. Separate the two strap pieces of the second strap by unthreading the short strap piece from the center buckle. Then, connect the loop end of each of those pieces to each loop end of the first strap (Fig 11). You will end up with one double long strap (see drawing below) that can be run through the vehicle, through the d-rings and over the top of the roof luggage carrier. There you can rethread the strap end from one side back through the center buckle (Fig 12) from the other side. The Car Clip Strap Set (Fig 13) (included with the Sport Jr. Car Top Carrier and purchased separately for Sport 3 and Sport 1 Carriers) is used to attach the cargo bag to the vehicle's door frame. Each Car Clip Strap requires a sturdy ledge on the inside of the vehicle door for connection. On most vehicles, the best ledge can be found under the weather molding around the door frame, however, you can use a rain gutter, a metal ledge, or the outside of the weather molding itself. Each strap has two strap pieces connected through a center buckle. 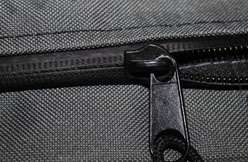 Unthread the short strap piece from the buckle and thread both the short and long strap pieces through the d-rings on each side of the cargo bag, bringing the two ends together over the top of the carrier. Then rethread the short strap piece back through the center buckle (Fig 14). Clip the hook ends in the open door frame and tighten the strap at the buckle. The door of the vehicle is shut over the clips/straps, securing them in place (Fig 15). Each strap’s long piece has a plastic tri-glide (Fig 16) to secure the extra length of the strap so that it doesn’t flap in the wind. Always check straps before driving and tie off any excess length (Fig 17). If the straps are too long, cut off the extra length and melt the cut end to prevent fraying. Do not attach straps to the d-rings as they will cause them damage. The strap tension from one side of the vehicle to the other over the top of the cargo bag secures the load. Position the straps at least 20” apart on each side of the vehicle (Fig 18). When the car top carrier is fully loaded, the straps are snug, and the loose ends are tied off, you are ready to go. We recommend a test drive around the neighborhood before you get underway. Remember to check the straps regularly throughout your trip. The Sport Car Top Carrier comes with a stuff sack (Fig 19) for convenient storage when not in use. The stuff sack has a draw string closure. 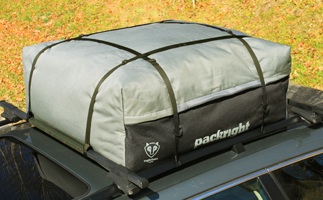 The PackRight Sport Car Top Carriers are made from our specially formulated Hydrotuff Material. Hydrotuff consists of a 600 denier woven polyester outer layer mated to a PVC inner layer. The resulting combination is a high quality, great looking, waterproof material perfect for use in a cargo bag. Hydrotuff is used in our Ace Car Top Carriers and our Cargo Saddlebag Car Back Carrier. Hydrotuff Material keeps its properties in extremely hot or cold temperatures. It is rated at UPF50 for UV protection which means it blocks 98% of the sun's harmful rays. The vivid colors of our roof top carriers will not fade over time. All logos are screen printed on the material and sealed in place. Hydrotuff has been used in our cargo bags for years and has yielded nothing but positive results. A PackRight Car Top Carrier made from Hydrotuff material is tough and will last for years to come. 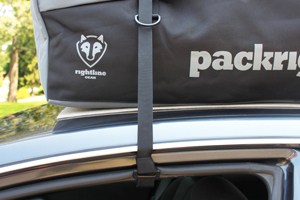 The PackRight Sport Cargo Bags also provide a great looking accent for your vehicle on your next trip.